2012 has been a tough year, even though we’ve barely knocked out the first quarter. “2012 can not get here soon enough” my husband and I both agreed, repeatedly, even though I felt guilty for purposely wishing even small moments of our lives away. December 31st, Savannah and I stayed up late, drank our Mott’s sparkling cider, and watched the ball drop. 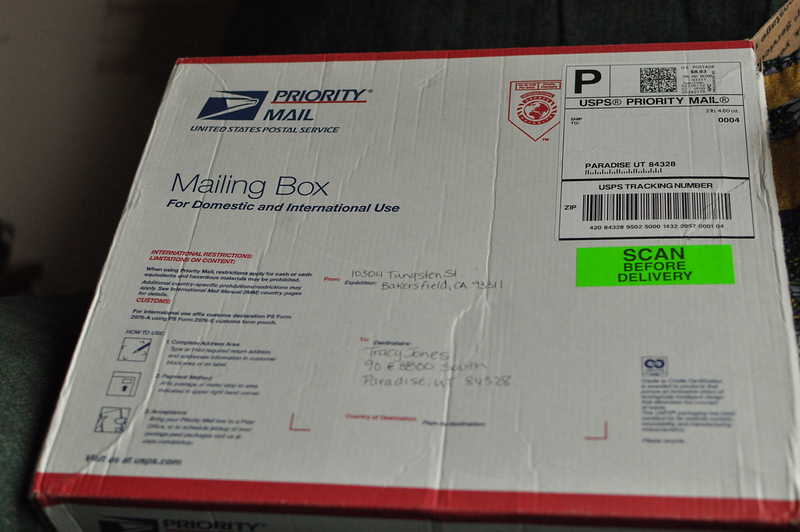 Twenty-twelve had arrived! The year started out well… Our Utah winter has been pretty much non-existent, so the days were chilly, sparkling blue skies, but no snow to drive through – in other words, perfect! Our son Josh was due to arrive home from Afghanistan before the end of the month in time for the birth of his first child, our grandson, due shortly thereafter. January 9th I started back to school. I had decided that this was the year to get serious about finishing my degree and signed up for two classes instead of my customary one. “After all,” I told myself, “the kids are mostly self-sufficient and don’t need or have time for me…” It was time to tackle one of the two (brutal) courses I have to pass with at least a B- to get into the English program I’m working towards. And man, that first day of classes was great! So, yeah… 2013 was sounding better and better! Luckily for me, God has blessed me with great friends and family. People I know, without a doubt, that I can turn to for prayer, for a listening ear, or a shoulder to cry on. People who, with small actions or a quick, kind word, (and even a new coffee mug!) brighten my whole day and let me know that everything will be okay. “What’s your address?” my aunt asked cryptically one day, in an all too infrequent phone call. I gave it to her, definitely wondering what she was up to. And receive one I did! 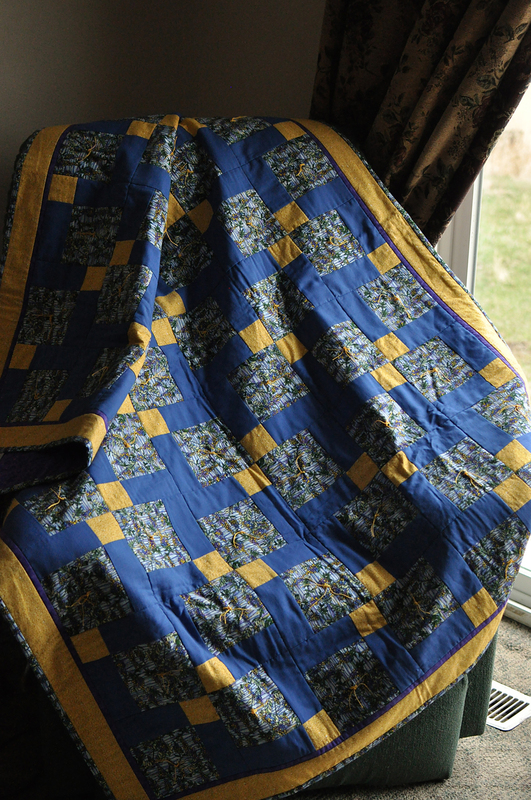 Inside was a beautiful tied quilt – all buttery yellows, royal blues, and deep purples (my favorite!). Even in the midst of all that has been happening, I know that God is taking care of us. The reminders come from seemingly-little things like a replacement coffee mug, to help from an old friend on the furnace, dinner from friends, the list goes on and on. 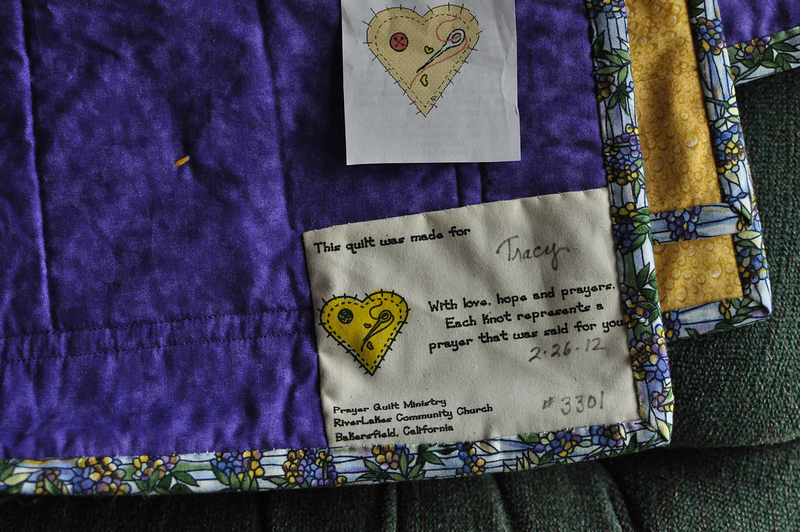 And my prayer quilt… a gift truly wrapped in love. 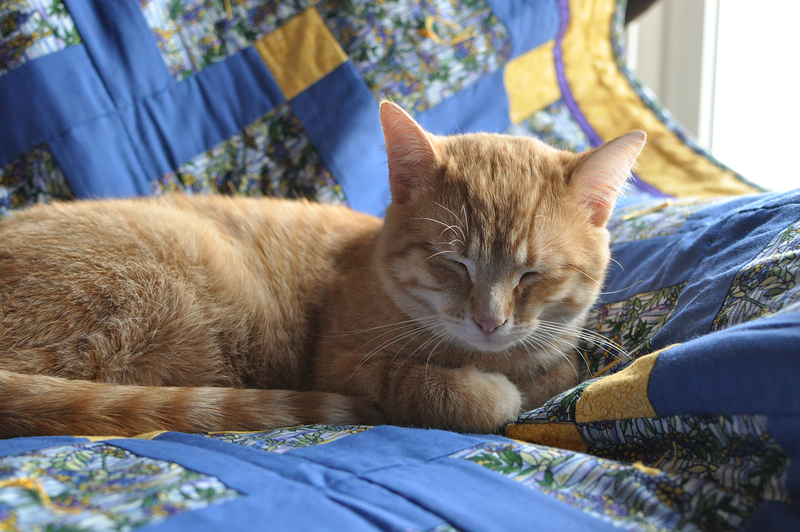 The quilt quickly received the "Morris seal of approval!" We may not share the same religious beliefs, but one thing we will always have in common is the power of prayer. It’s helped get me through so many trials, I could never do it without God to help me. That is a beautiful quilt. What a treasure! It was a blessing to be asked to send you this prayer quilt. I am going to share your blog with the quilting ministry at Riverlakes. I am sure it will encourage everyone to keep on doing the Lord’s work. It is soooo encouraging to hear words like yours said. 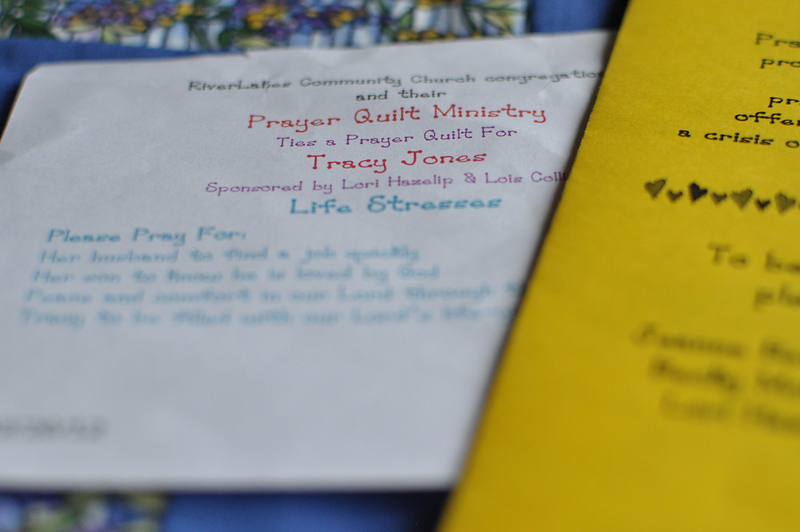 I help run a prayer quilt ministry for God. many times we do not directly know the people whose lives we impact. This is a reminder that even though we may never hear a word or even see the people, it does make the world of differance, and of course PRAYER CAN AND WILL CHANGE THE WORLD. 4 years ago Lois asked me to get you a prayer quilt. This showed up on my FB past posts. How are you doing today?